'Stunning' – An awful lot of Tottenham fans on Twitter are delighted with their new stadium | The Transfer Tavern | Where football transfer rumours fly or die! The Tottenham fans in the Transfer Tavern have been getting excited over the latest pictures of their new stadium. The club tweeted an update with some snaps of their ground from above and the fans are well within their rights to be pleased with it. The Lilywhites propping our bar up will be overjoyed when they can finally move into their new stadium next season. The club last played a home game in North London back at the end of the 2016/17 season when they beat Manchester United 2-1 in the last ever game at White Hart Lane before it was demolished to continue building the new stadium. However, the fans have to endure one more home game at Wembley before they move in. Last season saw the club play every home game at Wembley and the fans didn’t take well to the ground. The club recorded some memorable wins at the national stadium but that isn’t enough for the fans to miss their time there. 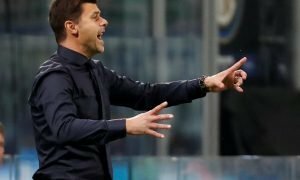 This season marks a historic one for Spurs fans as not only is it their third straight season in the Champions League, but it’s also an opportunity for the club to win their first league title in 57 years. Wow, certainly beats the old shelf. That looks pretty special from all angles. UP THE SPURS. Wow – the progress is immense! The Tottenham fans in the Tavern are rightly buzzing with the new stadium and will be even more pleased when they play their first game at the ground against Liverpool.